I write this piece with a heavy heart, as it’s not easy to do this. Long time readers of Theme Park University know that I have covered immersive theater many times over the past few years. It is easily the most exciting form of themed entertainment that has emerged since the advent of the theme park. I’ve written about it many times from Then She Fell to Drip, Play/Date and others. I’m a passionate fan of this genre and it’s one of the reasons I started this site. I’m also a huge fan of the Orlando Fringe Festival. 2015 will be my 15th consecutive year attending the event, which highlights over 100 plays that have helped local artists try out new material. These shows are always a roll of the dice, where sometimes you get crap and others times you walk away seeing some incredibly entertaining theater. 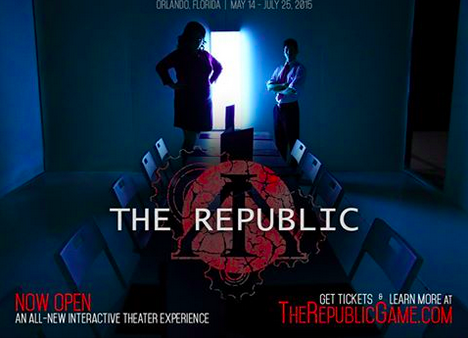 When I first heard about The Republic opening at the Orlando Fringe Festival, I was on cloud nine. Here is finally an immersive theater show in my backyard that combines gaming, unique characters and even Greek mythology. 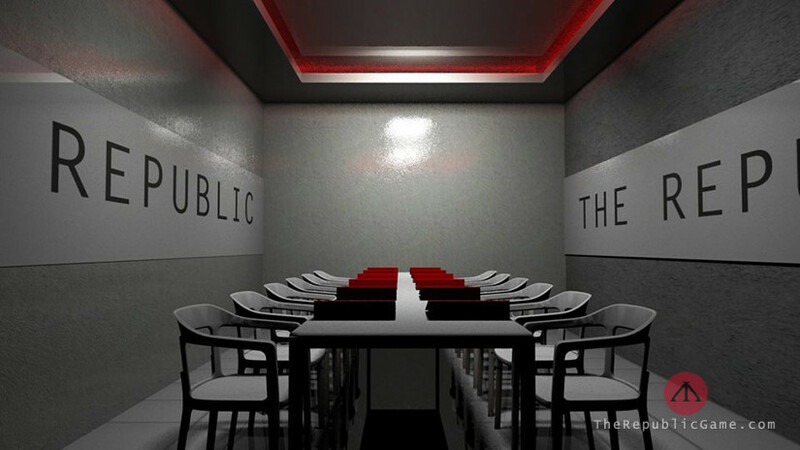 What follows is a SPOILER FREE review of The Republic in Orlando… and it’s not pretty. 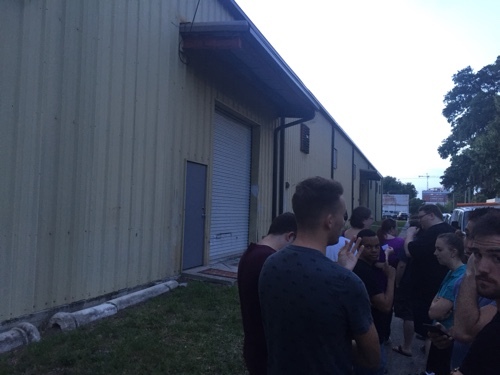 It’s also important to know that I went on the very first night of the Orlando Fringe Festival and their first true test with real paying customers. I knew going in that things weren’t going to be polished, that there might be some hiccups and indeed there were. Unfortunately, due to prior obligations, this was the only time I could visit The Republic during the beta test for the Orlando Fringe Fest. I was not given any kind of media comp and paid my own way in. For the sake of this review, I am not going to mention the parts of the show where I know that with practice, can be ironed out over the length of the run. Strap in. Operationally speaking, it was a disaster. According to everyone’s tickets the show started at 8:00 p.m. They started slowly letting in people in three at a time around 8:10 p.m. and this was a slow process. 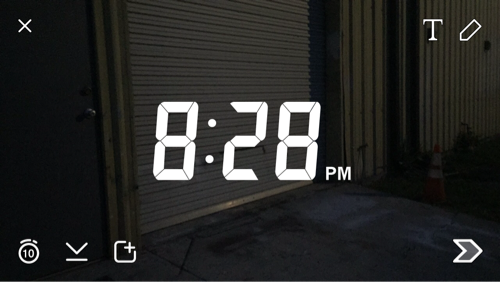 The picture above shows my camera roughly five minutes before I was walked in the building which ended up being around 8:35 p.m. No one told us they were running late, apologized for any inconvenience or explained anything at all for that matter. There was a character out front that was clearly part of the show checking tickets, getting snippy with us if we didn’t move fast enough or answer his questions the way we wanted him to. I get that it was part of the show, but if someone had at least given us a tiny bit of info, like if there were bathrooms inside or even had warned us to leave personal belongings like cell phones or purses in our vehicle if we so choose, it would have helped. Even mentioning that most of the warehouse where the show takes place has zero air conditioning? A great tip if you’re wearing a light sweater. Instead, once inside, we were directed to a small set of drawers. We were told to put our belongings in with everyone else’s and to remember what drawer was ours in order to retrieve them later. No organization, no lock, no kidding. From there, I was ordered to walk over to a table and sign a waiver, which I was aware I would be signing thanks to The Republic’s handy FAQ page on their website. What I was not expecting was to have the same character who was barking orders to the queue outside to be yelling at me to “hurry up!” and ask “what’s taking so long?” while I signed a legal document. That’s right lawyer friends, not only was I intentionally and loudly distracted while signing a form which absolves the venue of liability if something happens to me during my visit, another Igor/mad scientist character comes out of nowhere while I am trying to read, lurches over my shoulder and blocks my view. At the end of it all, I signed and dated it not knowing what the hell I just put my information. Sure, I didn’t have to put pen to paper, but I really wanted to do this and I have signed plenty of waivers for attractions in my time anyway, so I pressed on. Powerful stuff, right? If only it were that easy or even true. From the lobby, all guests are split up based on the color, numbers and symbols on their sticker. They are brought into smaller rooms throughout The Republic and given what seemed to be like hours (maybe 15 to 20 minutes) of exposition by one or more of the characters in the show. We learn about various social classes, characters we have yet to even see and what our role is supposed to be within this universe that Sarah Elger, the creator of this disaster, has designed for us. Once we learn about several characters (both in front of us and presumably elsewhere in the building), the class system, various parts of The Republic to explore and a bit more, we are given where we fit in. Guests are given their own class system, their own characters they are supposed to befriend and even individual jobs. For the next 10 to 15 minutes, I had to listen to what each smaller group of three within my class system was supposed to do as a task: what to do, who to talk to and who to trust and not to trust. Sound confusing? You have no idea and it gets worse. From there, you’re split into a group of three and brought into a separate section or room within The Republic. You are given a task and must bond with strangers to complete a common goal. An ice breaker, if you will. My particular task involved no actors, rummaging through a room trying to find information on someone within The Republic who is suspected to be up to no good. I’ve done escape rooms before and while this isn’t exactly that, there are clues to follow scattered and hidden in this particular room I am locked in with fellow theater goers who also have no idea what the hell is going on. How could we? We don’t really have a clear objective and the clues aren’t written in an intuitive fashion that can easily be followed. After roughly 10 minutes of tasking, two characters from the show come in the room and hand us the answer because we clearly didn’t know what we were looking for. Regardless, we are sent on a mission to find someone and ask them some questions because he’s up to no good. We are even given the list of questions to find out this intel! I look at my group, we look at each other and nod. Oh I get it… we are supposed to think beyond the page and ask the tough questions. We ask even more questions about his involvement in The Republic (not on the page) and I wish I were making this up: every single answer was yet again, “I don’t know what you’re talking about.” For the next few minutes, we all just sort of stare at each other not knowing what to do. With a sigh of relief, another character from The Republic comes in and asks us how we are doing. We tell him our interrogation is going nowhere. This character then makes sure we asked the questions on the page, we assured him we did and then some. He then takes the same sheet of paper we are reading from and, you guessed it, asks the same $&%@*#! questions. Yet again: no answers. This, my dear readers and fellow enthusiasts of themed entertainment, lays the problem: the audience has wasted their time with half the show where literally nothing gets accomplished, nothing of merit happens and the more questions you ask, the more brick walls you hit. Later on, participants are encouraged to explore The Republic at their own leisure. Not only did I not know what was going on, no one else seemed to. Either I or someone else would stop an actor and ask a question about what we were supposed to be doing and… I wish I was making this up… every time the actor would avoid the question and either dart out of the room or start a conversation with someone else as if the query had never been asked. Infuriating. Near the end of the evening when everyone was let loose to explore the building, you could put people into two camps: one was a small group that was really doing their best to explore and soak in whatever they could to make sense of it all and the rest/majority of us were just waiting for it to be over. Indeed there was a finale scene and it was every bit as entertaining as the rest of the evening – leaving nearly everyone scratching their heads. No matter, it’s the first night, right? After we were all ushered back into the lobby we were encouraged to talk to each other and share what we experienced to piece together what we just saw since we were broken up from the rest of who we came with for most of the show. 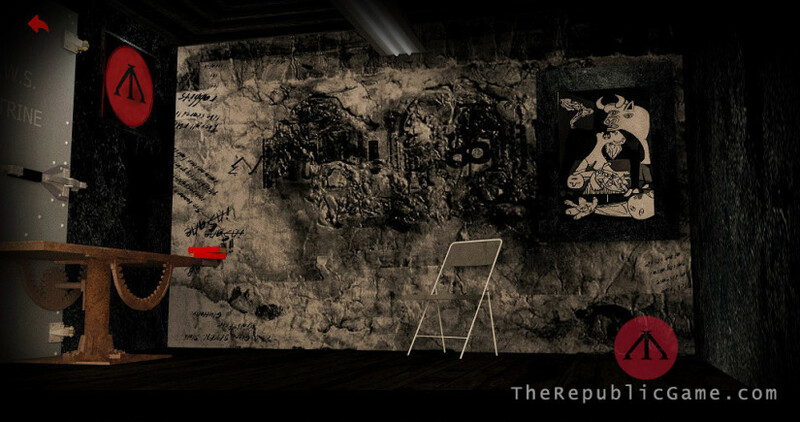 Aside from frustration, did The Republic draw any emotion from you either positive or negative? Out of the handful of people I asked including the small group of friends I brought with me the answers were: no, no and sadly no. Knowing it was opening night, I figured we would be greeted with a small army of people who worked on The Republic thanking us for coming and most importantly: soliciting feedback from genuine paying customers. Not one person working that night talked to a single guest leaving. Not even a thank you. Nothing. My blood was justifiably boiling. Instead, I stood around just outside the entrance talking with my friends and other patrons about what we just saw and tried to make sense of it. Why was there so much exposition? How did the characters connect to each other? More importantly, what was my specific role in this immersive theater show? I still can’t answer those questions and I don’t think I’ll be able to. As it turns out, one of the people I was talking/venting to outside the venue was someone who worked on The Republic behind-the-scenes and happened to be hanging around to hear what people were saying. I won’t reveal their identity, but this person was not involved with the show on a creative level. They understood and even shared many of my concerns and frustrations. People who work on these shows in Fringe or even immersive theater in its infancy get paid little to nothing at all, so I also sympathized with them too. About 20 minutes into my conversation, I asked, “Where is Sarah Elger, the creator of this show? Why isn’t she soliciting feedback?” My new friend shrugged and said they didn’t know why but said perhaps Sarah was busy. With that, my new friend who had put some blood, sweat and tears in this for quite some time pauses, takes a deep breath, extends their hand to mine and says “thank you, thank you” and shakes my hand. No more was said, nor was it necessary. And then? It happened. 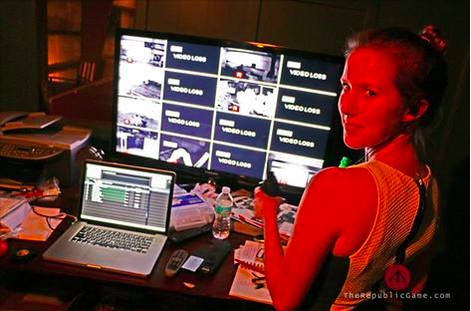 Thank you for bringing immersive theater to Orlando. A gutsy move to be sure. This town isn’t exactly known for cutting-edge productions that push the envelope. Don’t get me wrong, I love theme parks, mini-golf, escape rooms and Mickey Mouse. At the end of the day, compared to many cities around the world, most entertainment offerings in this city can be summed up in one word: vanilla. You decided to shatter that perception and create something truly unique that combines theater, gaming and improv. An eclectic mix to be sure and adding story layers that involved Greek mythology and even Plato was a bizarre, yet bold move. I’m sure this took months of your life and thousands of dollars and man hours donated by fellow enthusiasts who believed in your vision. Where your creation falls into a deep hole is simpler than you may think. A simple, yet undeniable aspect of The Republic was vastly off the mark: What is it like for an average guest to go through this show and what will it be like to be in their shoes? Before you start to think I am a cocky journalist who doesn’t know what you’ve been through to get this show open, you’re right. I can’t possibly know. 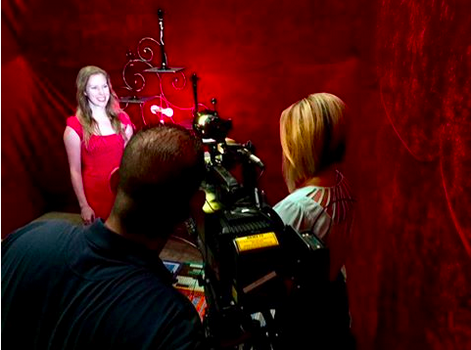 What I am is a passionate enthusiast who has traveled all over the world to experience new and bold entertainment. Not only do I love it, I crave it. What I do know is that regardless of story or theme, paying customers deserve better than what you’ve given at The Republic. Take a step back and examine the situation from my point-of-view. Also, don’t just take it from me. Listen to feedback from every possible source: theater industry veterans, theme park designers and most importantly: random people coming to your show just looking for something unique and different to do in Orlando. Don’t wait for them to come to you, seek it out. I promise it will help this show and anything else you do creatively in the long run. The ripple effect of this The Republic could be far greater than what the creators have considered. Click here to find out our thoughts. Make sure to follow Theme Park University on Twitter and like our Facebook Page! Doing any shopping on Amazon? Click the links on this page and it helps us pay the bills and costs you nothing extra! Thanks! This entry was posted in Immersive Theater, Outside The Parks and tagged Greek mythology, immersive theater, Orlando Fringe Fest, Sarah Elger, The republic, The Republic Review, Theater Review. Bookmark the permalink. Trackbacks are closed, but you can post a comment. Is there a point to the “spoiler free” review since nothing was learned from the show? Sounds bad. Too bad no one asked for refunds. I have not yet experienced the Republic myself yet, though I did attend an event there and found all the actors very good at improvising answers to interrogation. But shouldn’t you mention that you did NOT attend “opening night” but the first of what was clearly advertised as a series of BETA TESTS, for which you paid significantly less than the standard ticket price? Their real opening night isn’t until 5/29. Indeed I did mention that I was there at opening night of the Fringe “where local artists try out new material”. However, from a reporting perspective, literally no one on staff at The Republic made mention of the beta test. Sure, I’ve been following this for a while and I knew that. However, I brought friends who were aware of the show just casually and didn’t follow as intently as I did. After it was over, I had to explain that to them – because no one else did. All immersive theater gets tweaked and changed regularly. It will always be a work in progress, no matter the show or the venue. I was also there for the opening beta and thoroughly enjoyed the Republic. It was a little disjointed and slow at times and a few of the portrayals were a bit odd; however, all in all, it was fun and I would go back so I can experience the game from another point of view and one of the other endings. I want to address your interrogation scenario as you specifically talk about me in this article. I was the guy you interrogated about the illegal activities in the Republic. Though it shows an inherent flaw with the Republic and similar attractions, I love the interrogation scene…perhaps at your expense and enjoyment. You talk about how I consistently answered that I didn’t know anything about what you were asking me; however, I lied. Completely. I knew everything about Republic employment and the shady things therein. You and your fellow interrogators followed the script provided to you but you didn’t follow the directions of the game that you quoted in the article. You asked questions that weren’t on the page, that’s true, but you didn’t really ask anything that wasn’t a rewording of the questions on the page. You didn’t try to work the system until the Actor told me I would be blamed for everything y’all had discovered resulting in my banishment…and then none of you carried that on or pushed that possibility. The three of you just stood there staring at each other and then at me as I leaned against the table with the light on, grinning from ear to ear, and completely unwilling to give up any information until something was offered to me other than a minimal threat. If you’d like proof that I am who I say I am: you saw my picture and talked to me during the interrogation, I’ll happily add a profile picture if I can figure out how or you can check my facebook page linked to in my username. To be fair, you got unlucky since they randomly chose an attorney for you to interrogate. Thanks for chiming in! No need for proof, I totally believe you were in the same room as me. I am going to expound upon your comments in a future article, I promise. For now, the problem remains: if a paying customer doesn’t enjoy themselves at an interactive show because they didn’t do it right, it is the problem of the designers – not the audience member. It’s a common flaw in many of these types of attractions, as you stated. However, just know that we were given no information other than those questions and had literally NO clue what was going on. If we knew what to do or had even a smidge of background info, it would have been most helpful. This confuses me even more.. Was the man you were interviewing an actor or an audience member? It’s an interactive game so the “audience” are like players and the cast members are like NPCs in a video game. I was an audience member and, prior to being interrogated, I was interrogating a different audience member with the help of 2 other audience members and one cast member who helped guide us along a bit once the interrogation went in certain directions. When I was interrogating, we did not have a script, just a bit of guidance on what we needed to ask the audience member about. Then it honestly seems like an issue with how they handle this. Josh’s group was given three questions to ask. You made a choice not to answer them as you felt they did not ask them the correct way. Then a cast member asked you the key questions and still did not want to answer it. Something here is not right. If one audience member can ruin the experience for another group with the way they choose to be interrogated, then that is really bad. Sorry you’re a lawyer. Your refusal to answer questions should be considered a violation of the rules. What’s the point of lying? It sends the game in the wrong direction. If it was a real interrogation, you’ll have all night, but one only has so much time to play the game. You still recommend people to go. Why? A staff member should be monitoring the situation and moving the story along. Instead it was just a mess.